While there has been some excellent football played in the 2012/13 season, finding a close title race in Europe’s top leagues has been a more difficult task than that of Luis Suarez’s PR officer. Manchester United, Barcelona, Bayern Munich and Juventus have run away with their domestic leagues, with the destination of these trophies decided long before May. In addition to this, three of the four Champions League semi-finalists are the same as they were last season, with only Borussia Dortmund to shake things up a bit. However, there is a competition that has been extremely exciting and unpredictable, with no less than four teams competing for the title. With three games remaining in Holland, Vitesse Arnhem, Feyenoord, PSV Eindhoven and Ajax can all still lift the trophy. A run of six wins in a row has seen Ajax move into pole position to take the title for the third year in a row, but the slightest slip up could see them not only lose the title, but drop out of the Champions League altogether. Having already explored some of the best that German and Italian football has to offer this season, I decided it was time to branch out into the Netherlands. 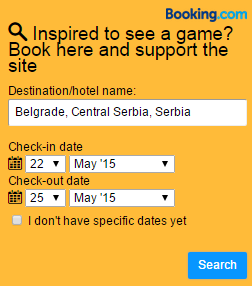 The way fixtures are scheduled makes it possible to take in more than one game in a weekend. Tickets were secured for Ajax vs. Heerenveen fairly easily (for 12 Euros! ), but Feyenoord vs. Vitesse Arnhem selling out within five minutes of going on sale left me looking for an alternative. An invite from the official Twitter account of VVV Venlo was enough to convince me that they should be my adopted side for the weekend, with the extremely helpful staff at the club assisting with not only a ticket for the game again FC Twente, but throwing in a black and yellow scarf for good measure. The trip confirmed, it was time to begin the Eredivisie adventure. Football may not be the first thing on the mind for everyone on a Friday night in Amsterdam, but this didn’t stop over 51,000 people packing in to the highly impressive Amsterdam ArenA. With the Dutch traditionally loving football and Ajax one of the biggest teams in Europe, I did not anticipate a problem when booking a taxi from the hotel to the ground, a distance of just over a mile. However, the man who turned up to transport us to the stadium not only had no idea where the stadium was, but had to ring his brother to confirm that a team called Ajax even existed. After these crisis talks, we finally arrived at the ground and sent the worlds worst taxi driver on his way. The Amsterdam ArenA opened in 1996, and is considerably different in design to the majority of modern stadiums. The different coloured seats are presumably meant to represent something, but instead looks more like the construction team ran out of red chairs and had to finish off the design from eBay. The proud history of Ajax is reflected throughout the stadium, none more imposing for an away side than the numerous flags which hang from the roof, each one representing one of the many trophies won by the most successful Dutch team. This is a club which is used to winning, and the fans were in the mood for a party here. A win would send them 8 points clear with just 9 left to play for, all but securing the title for another season. “Stand up for the champions” was the most common chant in the build up to the game, which was topped off by a highly impressive flag and pyro display as the sides prepared for kick off. In my many adventures around Europe I have seen many big flags and countless flares, but this was the first time I had seen a flag with a flare on. We were located in what is usually the away section of the stadium, reduced due to the small number of travelling support. It was fairly clear that the away end had previously been home to some rather shady characters, demonstrated by the wall separating the sets of supporters, best described as ‘spiky’. Quite how many people would choose to jump thirty feet or so on to the home fans wasn’t clear, but clearly nothing was being left to chance. The game got off to a fast start, with both sides more than willing to get forward and attack. Ajax took four points from Premier League winners Manchester City this season, and it was easy to see why. All that was missing was the finish, as the home side looked to get the title celebrations into full swing. A number of Ajax players have been linked to English clubs in the upcoming transfer window, with Viktor Fischer and Christian Eriksen showing signs of why they are so sought after. Meanwhile, Finnbogason of Heerenveen was one of the best players I have seen play all season, with the Icelandic forward having scored 27 times in 29 matches coming in to this game. Just as the tactics for the Welsh team involve ten large arrows pointing at Gareth Bale, this certainly seemed to be the plan for Heerenveen with Finnbogason. Despite Heerenveen showing some impressive moments of class, it was not long until Ajax took the lead. The pace of the wingers was too much for the visitors to deal with at times, with a cross from the right side being headed into the net from close distance by the impressive Fischer. The atmosphere had been impressive up to this point, especially from the corners of the ground where the Dutch equivalent of Ultras were located, but it was about to go into overdrive. The stadium was actually shaking such were the celebrations from the Ajax fans, clearly expecting to go on to claim the victory they needed to virtually guarantee the title. The red and whites would go on to waste several chances to extend their lead as half time approached, it certainly seemed at this point that the home side would take a fairly conclusive victory. However despite a strong performance on the pitch and a party atmosphere in the stands, the score remained just 1 – 0 as the referee blew his whistle for half time. If the Amsterdam locals expected the second half to follow the same title party trend, they had reckoned without the efforts of the determined visitors. Heerenveen may not be in the title picture, but European qualification is up for grabs and this was far from a meaningless fixture for them. The second half would be a very different story, as the side nicknamed De Superfriezen came out with a greatly improved attacking mentality. As with many German sides I have watched, a selection of Heerenveen songs were sung in English, including “Blue and White army” on repeat for much of the second period. It was just eight minutes after the restart that the visitors found their equaliser, with star man Finnbogason finding the net once more. The ArenA fell silent, apart from the small corner of away fans who were celebrating wildly. This hadn’t been in the script for the home support, who were serenaded with “Always look on the bright side of life” by the travelling faithful. Perhaps content with a draw (why wouldn’t they be?) Heerenveen sat back and frustrated Ajax, who were now faced by the prospect of allowing their rivals right back into the title hunt. As much as Ajax pressed, they could not find a way through the wall of defenders, with shots rebounding off the post and several superb saves, as well as some intricate passing which just couldn’t find a finish. At times Ajax passed the ball like Barcelona but shot like Barnet, One move in particular saw five or six beautifully flowing passes, with the ball setting up perfectly for a volley which would have been one of the goals of the season, instead, Hereenveen got a throw in. Ajax showed plenty of the class which has seen them produce a frankly ridiculous number of world-class players, but tonight at least the final touch wasn’t quite there. Hereenveen almost won the game in the closing moments, as the pace of Finnbogason undid the Ajax defence once more. The crowd had recovered from the shock of the goal and was fully behind the team now, desperate to find a goal that would allow them to have their party after all, but it was not to be and the game came to a close at 1 – 1. The Heerenveen players saluted the away fans with cheers and fist pumps, while the disconsolate Ajax players trudged around the stadium to thank the fans for their support. It was clear which side was happier with the outcome, and the Eredivisie title race had just got exciting again. 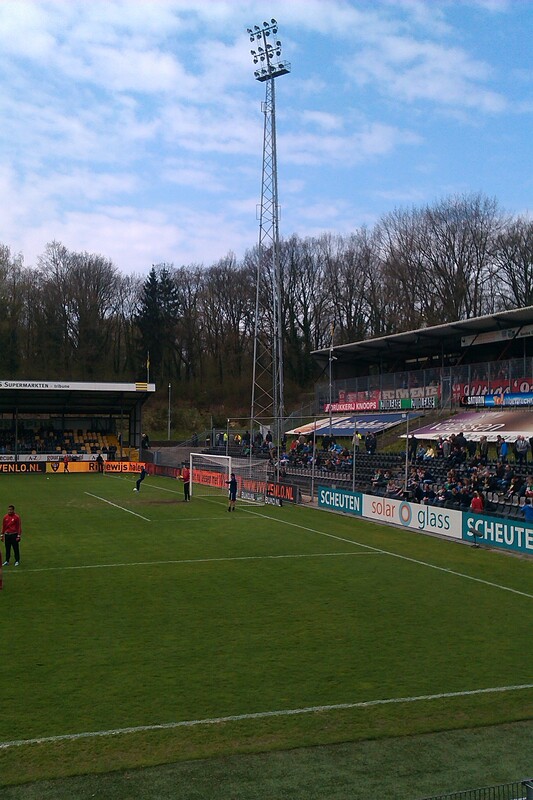 On the way to Venlo we happened to pass a match in what we would discover was around the ninth tier of Dutch football. Our presence increased the attendance at the game by 25% (there were two of us), with the players somewhat bemused by my lone support of the team in yellow. One of the linesmen was the father of a player involved in the game, with any idea neutrality blown out of the window when he celebrated a goal. To be honest, I’ve mainly included this game in the report as an excuse to post this picture of me forming the one man Yellow Ultras. The game finished at least 7 – 0, with a player on the white team sent off for attempting to headbutt the referee. Even in the 9th tier, that is rarely a good idea. An unexpected extra match on the trip, it was soon time for a return to the top division. 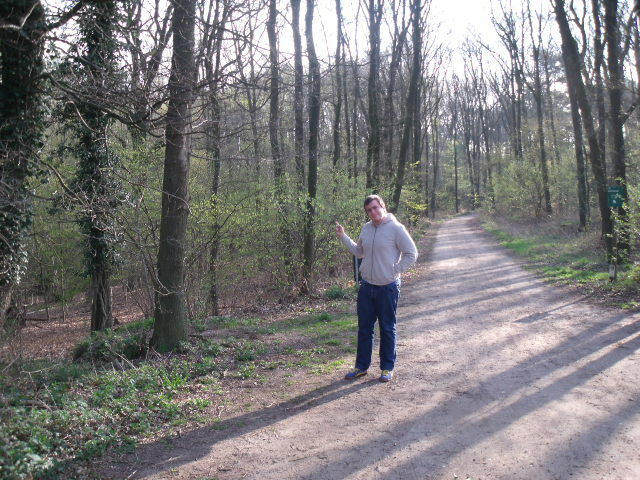 Fortunately, some passing hikers were able to point us in the correct direction and we soon arrived at the home of the Venlose trots. While the Dutch supporters enjoy considerably more freedoms than fans in the Premier League, there is still a strong Against Modern Football feeling in the Netherlands. Numerous examples of this could be found, from stickers around the town of Venlo itself, to a banner in away end protesting the early kick off. I have seen football at Westfalenstadion, the San Siro, Amsterdam ArenA and the Nou Camp on my travels to Europe, stadiums famous around the world and on the wish list to attend for many lovers of the game. De Koel of VVV Venlo is unlikely to be on many bucket lists, but is certainly one of the most enjoyable places I have ever watched a football match. This almost certainly would not have been true if I was in the away end, with the visiting supporters looking more like prisoners, housed in a giant cage which took up about half of the stand behind the goal. The tickets given to us by the club were for the main stand, but we decided to walk around the ground to stand on the large terrace which ran across the entire length of the opposite side of the pitch. With Venlo in dire trouble at the bottom of the table, a loss in this game would cement their place in the bottom three. Unlike many leagues around Europe, there is only one automatic relegation spot in the Eredivisie, with the other two sides finishing in the bottom three forced to content relegation/promotion playoffs with the division below. The black and yellows would not be directly relegated if they failed to pick up three points against Twente, but it would extinguish any hope of avoiding these intense playoff games. FC Twente were champions of the Netherlands a few years ago, considerably ahead of Venlo in the table and currently taking up 5th place, enough to gain them entry in to the playoffs at the top half of the table, with victory in these playoffs rewarded by a place in the Europa League. This meant it was an extremely important game for both sides, with Twente overwhelming favourites to take victory. However, just as Hereenveen had gone against the script against Ajax, so did Venlo here. A large banner running across the entire length of the stand behind the goal read in English “Our hope and our love will last forever”, and their were quickly a number of reasons for the home side to be hopeful. A sustained spell of pressure after 15 minutes forced a corner on the right hand side, with a smart header by Nils Röseler ending up in the back of the net. An awkward moment for Röseler, who is currently on loan at Venlo from, you guessed it, FC Twente. To make matters worse, the opening goal against his own side was the first goal of the 21-year-old’s career. The Venlo fans were daring to dream, and celebrated the goal wildly. It would take a miracle for them to be lifted out of the bottom three by the end of the season, but just like the Hot Chocolate song, they believed in miracles. Things were to get even better just two minutes later, as striker Uche Nwofor scored a goal which was half sublime, half ridiculous. The powerful number 9 went on a run, beating several players and working his way in to a good position just outside of the box. He had shown excellent skill to get into the position, but produced a poor shot. It rolled along the floor and looked as if the Twente goalkeeper could have gone to the bar for a pint and still got back in time to save it, but somehow he allowed the ball to trickle past him and in to the goal. You know a goalkeeper is embarrassed when he pretends to be injured after a goal, and this was the case here as the jubilant Venlo players celebrated their 2 – 0 lead with just twenty minutes on the clock. At this stage it looked as if a rare and memorable victory could be on the cards for the relegation-troubled hosts, but all the quick flurry of goals did was give Twente the wakeup call they needed. They began to pass the ball well, breaking down Venlo several times and only denied by a combination of good goalkeeping and poor finishing. 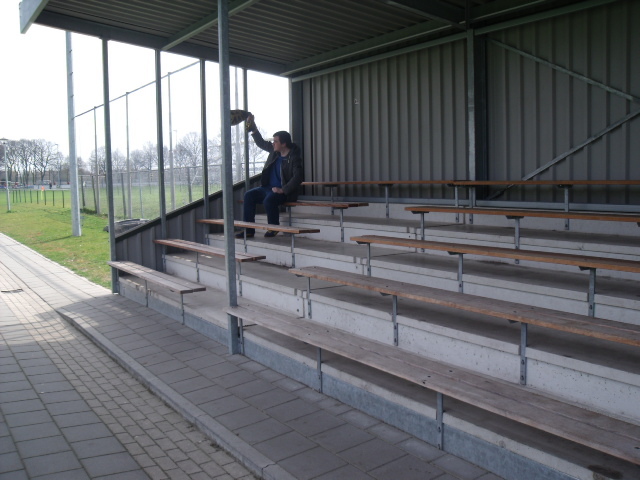 Somehow, Venlo held on until half time with the 2 – 0 lead still in place, but there were a number of worried faces around the stadium as half time pints and strange smelling cigarettes were enjoyed by the home crowd. The FC Twente manager was one of the angriest men in the world, and it was no surprise that his side upped their game further still after the break. The young Venlo side did their best to hang on, but it was only a matter of time until the stronger and more experienced visitors scored. With around half an hour to go, you could almost sense that the Venlo fans would settle for a draw at this stage, despite holding a 2 – 0 lead. The breakthrough finally came for Twente, with Rasmus Bengtsson finding the net after some poor defending. The goal caused Venlo to fall apart, with Luc Castaignos scoring a second goal for Twente less than thirty seconds after the match restarted. The Twente fans no longer seemed to mind they were in a giant cage, celebrating the equaliser wildly. One of the ultras even managed to climb to the very top of the stand to celebrate, before eventually leaping from the top of the fence back into the away supporters. Luckily one of them was able to catch him, otherwise he would have required a trip to hospital rather than a prison. At this point it looked as if Twente would go on to win the game quite comfortably, piling on the pressure and testing the goalkeeper on a number of occasions. To their credit, Venlo recovered sufficiently to take a point, but the result means their survival will be in doubt until the very last game of the season. With three matches remaining, they are three points ahead of the side in last place. They must avoid finishing below Willem II to give themselves another chance to survive, with the high drama that any form of playoffs bring. 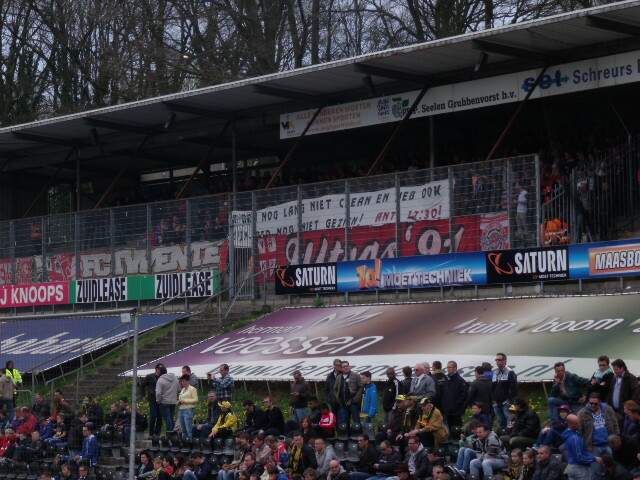 I greatly enjoyed the visit to Venlo and sincerely hope they can survive for another season in the top division. Watching football in a pit surrounded by trees is a unique experience, and lovers of old school floodlights would certainly enjoy joining the 7,000 or so fans who call the club their own. While on the whole I have had more spectacular trips than this when visiting Germany, I will certainly be keeping a close eye on the Eredivisie from now on. With a number of strong sides competing for the title, and playoffs for both relegation and European qualification, there is always something on the line come the end of the season. The attraction of playoffs for European football is certainly an appealing one, Tottenham and Arsenal facing each other over two legs would be an incredible spectacle and something I am surprised Sky Sports has not already thought of. Unlike their German neighbours, it has been a while since Dutch teams were able to compete in the latter rounds of European competition. However, there are certainly lessons that can be learnt from this league and is yet more evidence of the shoddy way that English football is run and the way supporters are treated. It appears that more and more English supporters are starting to sit up and take not that things do not have to be the way they are, and that fans in other countries manage to support highly competitive teams without having to sacrifice an enjoyable matchday experience with realistic prices and excellent atmospheres. English football cannot go on this way without ruining the game for fans forever, the only question is whether or not those in charge of the game in this country realise this before it is too late. For now, we will continue to have to view such leagues as the Bundesliga and the Eredivisie with envy.